We all know use of barcode, right! It helps business to track a product or order quickly and accurately. Like in any supermarket, barcode helps to identify items easily and accurately. But how to generate barcode from Siebel or any other system? Can we generate and display barcode on Oracle Business Intelligence Publisher Report? Answer is YES, we can use BI Publisher as barcode generator and print/display barcode on report. Recently, I was working on a requirement for one manufacturing company where they were looking for better approach to track Service Request and RMA (Return Material Authorization) of products distributed among different systems. So easiest and reliable solution is Barcode but how will it help them to meet their goal? Well, let me give you a business scenario. Right now, business uses Siebel CRM application to create service request of any product or order. Suppose for RMA type service request, Siebel system will generate the RMA number and then send it to dispatch section for mail communication. So for dispatch section, it is manual task to enter RMA number into System. Next for RMA working department, it is another manual task to enter RMA number into their system. In complex system, business could have more hierarchy and more hierarchy means higher chance of doing wrong entry. So they need automation of this manual task to make the process faster and error free (almost error free) and best solution is barcode automation. Siebel will generate the RMA number and send it to reporting system (here business is using BI Publisher for reporting purpose). Then BI Publishers will change the RMA number to barcode which will be referred by all other business units. To read barcode, business units need only barcode scanner which will change the barcode to actual number and make an entry on their system. Faster and error free, isn’t it!! Now, question is how BI Publisher will generate barcode and print it on report? Barcode is nothing but special kind of font which barcode scanner only can read. There are few free barcode fonts and few paid fonts. As per requirement, you could pick free font or paid. For our requirement, we have used free barcode font 39HIHR.ttf of barcode39 font family. In Microsoft Word, 39HIHR.ttf looks like below (barcode above and number down). Next check BI Publisher Desktop is installed on your system or not. We need it to build template with barcode font. If BI Publisher Desktop is installed, then you could see Oracle BI Publisher Add Ins tab in MS word. I hope you know how to add bookmark to display field in report. Here we have added two bookmarks, one for SR number and another for RMA Number and we have picked BC 39 HI HR font (which is nothing but display name of 39HIHR.ttf font) for both two fields. Once report template is ready, see the preview to check barcode font. To see preview, first add the font in xdo.cfg file, located under ..BI Publisher DesktopTemplate Builder for Wordconfig. If you are doing for first time, then you may have xdo_example.cfg instead of xdo.cfg. We have to rename this file as xdo.cfg and add below script under ‘<!– Font setting –>’ section. Now we can see the preview of the template. To see preview, click on Preview option from Oracle BIP Toolbar and select the report type (example PDF, DOC, HTML). If the template preview does not meet our requirement, modify it and verify it again. Once the template is ready, generate XLIFF file from the original template. At runtime, original template is applied for the layout and the XLIFF file is applied for translation. Now our template and XLIFF file are ready. Next step is font mapping in BI Publisher so that we could use BIP as Barcode Generator. Follow below steps to configure new font in BIP. As per report template type (RTF or PDF), click on ‘Add Font Mapping’ button to add font. As we have used RTF template for our requirement, font mapping for RTF template type will be sufficient, no need to do anything on pdf font mapping option. Click on ‘Apply’ button from right hand side top corner and restart the webserver (OC4j or tomcat) service. That’s all. Now goto Siebel application, upload files (template file and XLIFF file) on Administration-BI Publisher and generate reports. You could see nice barcode on the template. – Sometimes barcode scanner needs barcode terminator to read the code properly, mainly if you are using code39 barcode font. Here we have used * (asterisk) as terminator. If you have any doubt or question, feel free to ask us. To get more updates on recent activities, follow ‘TechOneStop’ on Facebook/Twitter/LinkedIn or join our website as followers. In our next article, we will discuss about how to display MICR code and QR code on BIP Report. So far we have discussed what is Siebel Open UI, its architecture, customization of Presentation Model, Physical Renderer and Manifest File. In this sixth module of Siebel Open UI training series, we will discuss about Siebel Open UI theme. So lets start with Cascading Style Sheet definition. – CSS browser extensions are browser specific style properties but not (yet) part of official CSS specification. Each browser has its own CSS extensions. Also styling rules for one browser do not work with other browsers. – CSS extensions are definied by a dash (-), then browser short name (e.g. webkit, moz, ms, o), another dash and style name. Now what is Siebel Open UI Theme? 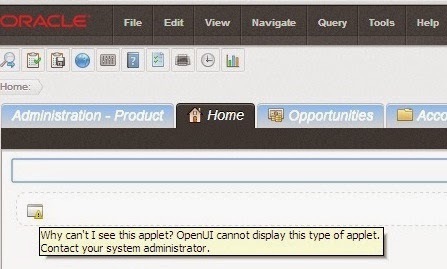 How an user can change a theme in Siebel Open UI application? If the new theme is not applied after logout-login, clear all historical data from the browser and reload the application again. Where to keep all custom files like SWT, JS or CSS during Siebel Open UI theme customization? – It is advisable not to update any out of box SWT file. If you have to modify any out of box SWT file, copy it first and then update it. You keep all custom SWT files under siebsrvr_root\WEBTEMPL\ OUIWEBTEMPL\custom in Siebel server. Now how will you decide that creating a new theme is better option or just modify existing Siebel Open UI theme? If your new theme slightly differs from as-delivered theme, then modify the existing Siebel Open UI theme. You can copy vanilla CSS files, modify it as per requirement and place it under CUSTOM folder. But if the new theme differs significantly from as-delivered Open UI theme, create new style sheet file/s altogether. For example, if it is just font size or font color change, modify existing CSS file. But if you want your Open UI application looks like Facebook, build a new CSS file. Now first we will discuss steps to modify an existing Siebel Open UI theme and then create a new theme. – Use ‘Inspect Element’ browser tool to identify CSS rules and sequence. – Almost every modern browser has ‘Inspect Element’ tool to verify various elements of web pages. – Inspector displays all rules in the order of priority. If a CSS property appears in multiple rules, then the property value from the highest priority rule will be applied. Inspector element strikes through the text to designate that the property is not applied. – Use ‘Inspect Element’ developer tool to modify existing rules or add new CSS rules from the browser. – Copy all custom CSS rules and check the CSS file name. File name appears under ‘Styles’ tab on top right hand corner. – Once you refresh the webpage, all inline custom changes will be removed. – If it is small CSS change, you can modify vanilla CSS file/s directly. You can also copy the vanilla CSS file, paste it in ‘Custom’ folder and update it. – If you want to create a completely new CSS file, copy-paste entire set of CSS rules into one text file and save the file with .CSS extension. – If you modify the vanilla CSS file, no need to define the file in theme.js. You can go to Step 5 to verify changes. – If it is new CSS file, then you have to register it in theme.js file. 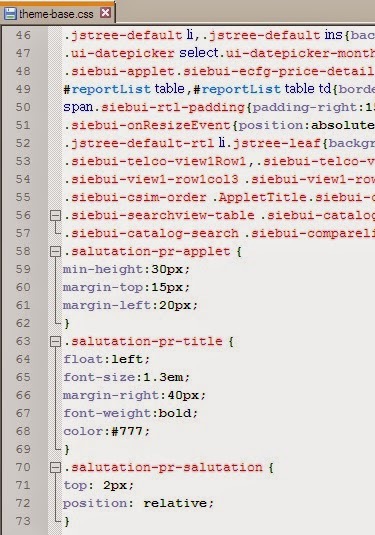 You must use an unique id to define the CSS file in theme.js file. Next we will discuss how to build a new Siebel Open UI theme altogether. – You know, if the custom theme differs significantly from as-delivered Open UI theme, it is better to create new style sheet file/s. – To create the new CSS file, use ‘Inspect Element’ browser tool – add or edit CSS rules inline, test all rules and then copy-paste the entire set of rules into new CSS file. – Every theme has to be defined in theme.js file. To avoid theme related issues during application upgrade, add all custom themes under \custom\theme.js file. This end our sixth module on Siebel Open UI theme.